A new 'Beginner's Zone' will be introduced. 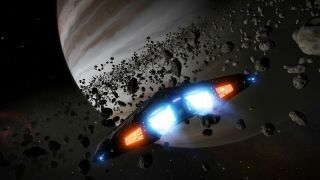 Elite Dangerous' next update, due to land on April 23, will add a whole host of improvements as well as making the space sim more welcoming for new and returning players alike. A new Beginner's Zone is being added, which will give newcomers a number of systems to explore while they get to grips with the game. There will be much simpler missions to complete here, as well as a reduced rebuy and players will be able to take advantage of this zone until they earn their first Combat, Trade or Exploration rank. The Pilot's Handbook is another addition aimed at making Elite Dangerous much more player-friendly. This will give you access to information on all the activities that are available in the game, as well as the requirements to get involved. New modules are also being added; an Advanced Docking Computer will let you automatically dock and undock from stations. Meanwhile, Supercruise Assist will let you target a destination, then sit back and let the machine do the rest of the work. Both of these modules will come as standard with all new ship purchases and you won't have to worry about spare module slots existing ships as the update will include the automatic addition of extra slots. Another improvement is the addition of a new column on the Navigation Panel which will show activities in an area such as mission targets, plotted routes, and Wanted status. And there's also good news for traders with Trading Screen updates with tweaks to the Commodities Market UI. Finally, Interstellar Initiatives are also being introduced, and developer Frontier has promised there will be more info on these in the coming weeks. What we do know, however, is that they will be in-game events with several phases, some of which may have long-lasting effects on the galaxy. You can check out the notes in the full announcement here.